Tagline The final chapter in the incredible Apes saga. The most suspenseful showdown ever filmed as two civilizations battle for the right to inherit what's left of the earth! Battle for the Planet of the Apes is a 1973 science fiction film directed by J. Lee Thompson. 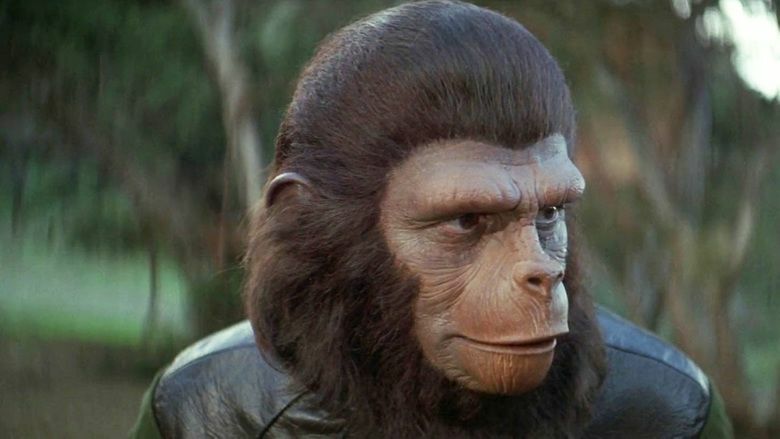 It is the fifth and final entry in the original Planet of the Apes series produced by Arthur P. Jacobs, following Conquest of the Planet of the Apes. It stars Roddy McDowall, Claude Akins, Natalie Trundy, Severn Darden, Lew Ayres, Paul Williams and John Huston. The two sequels in the 2010s reboot series, Dawn of the Planet of the Apes and War for the Planet of the Apes, have a similar premise to Battle, but they are not officially remakes. Told as a flashback to the early 21st century with a wraparound sequence narrated by the orangutan Lawgiver (John Huston) in "North America - 2670 A.D.", this sequel follows the ape leader Caesar (Roddy McDowall) years after a global nuclear war has destroyed civilization. In this post-nuclear society, Caesar tries to cultivate peace between the apes and the surviving humans. 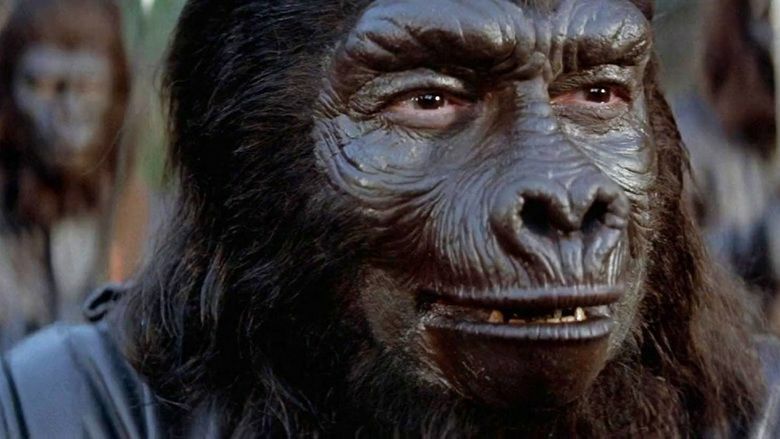 A gorilla general named Aldo (Claude Akins) however opposes this and plots Caesar's downfall. 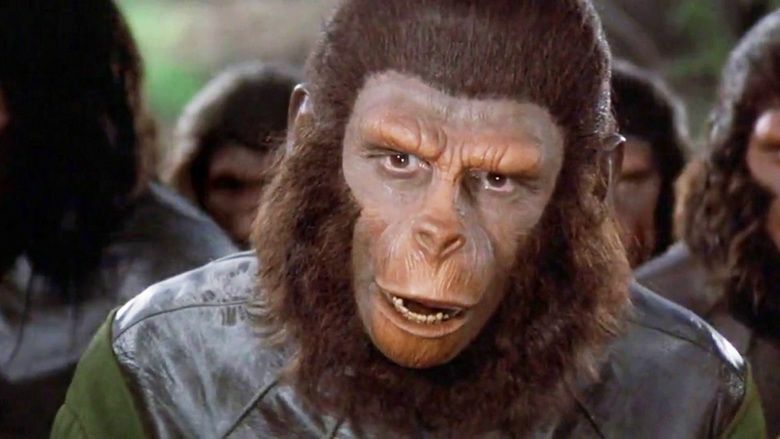 Caesar is married to Lisa (Natalie Trundy), the female ape of the previous film and they have a son named Cornelius (Bobby Porter) in honor of Caesar's father. Caesar regrets never having known his parents until his human assistant MacDonald (Austin Stoker) tells him about an archive film of his parents where he can also learn about the future. The archives are located in the Forbidden City, now a radioactive ruin. After obtaining a geiger counter and weapons from the armory, Caesar travels with MacDonald and orangutan Virgil (Paul Williams) to the Forbidden City and sneaks in to find the archives. However, there are mutants (radiation-scarred humans) still living there under the command of Governor Kolp (Severn Darden). Caesar and his party view the recordings of Cornelius and Zira and learn about the future of the world, but barely have time to study the tapes before they have to escape being captured. Caesar assembles a meeting to report his discoveries at the Forbidden City. Aldo objects when some humans show up and he leads the gorillas away. A team of scouts sent by Governor Kolp return and tell him about the Ape City. Kolp considers this covert trip by Caesar an act of espionage. 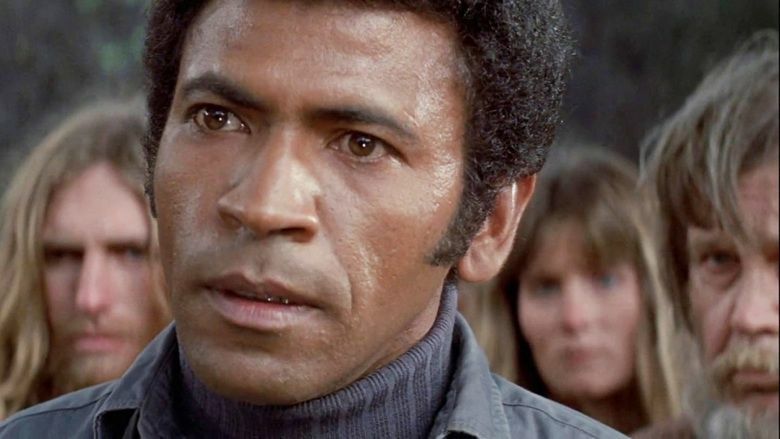 His assistant Méndez (Paul Stevens) believes they did nothing wrong and should be left alone, but Governor Kolp stubbornly declares war on Ape City, mustering the mutant humans to destroy the ape society. Aldo is furious that Caesar wants to co-exist peacefully with humans and plots a coup d'état in order to become the Ape leader himself. Cornelius overhears this while trying to catch his escaped pet squirrel in a nearby tree. Aldo spots him and hacks the tree branch down, critically injuring Cornelius. After a gorilla scouting pair is attacked by the approaching humans (though the gorillas struck the first blow in this case by killing a human scout beforehand), Aldo orders all humans to be corralled and leads the gorillas to loot the weapons' armory much to Virgil's dismay. Cornelius eventually dies from his wounds, leaving Caesar devastated, but not without leaving him with a warning about Aldo's coup. It is at that moment that Kolp's ragtag force launches their attack against Ape City. The initial mutant attack succeeds, forcing Caesar to order the defenders to fall back. When Kolp finds Caesar lying among dozens of apes, he threatens to kill him, but the fallen apes, who were feigning death or hiding on Caesar's orders, launch a counter-attack that captures most of the mutants. Kolp and his remaining forces are killed by Aldo's troops while attempting to retreat. After the battle, Aldo wants to kill the penned humans, but Caesar shields them. Aldo declares that Caesar should be killed if he shields the humans. However, Virgil reveals Aldo's responsibility for Cornelius' death and the breaking of the ape community's most sacred law ("Ape shall never kill ape"). An infuriated Caesar pursues Aldo up a large tree, resulting in Aldo falling to his death during the fight. Caesar then attempts to free the humans, but they refuse to leave the pen unless humans are treated as equals. Caesar then realizes the apes are just as despicable as their former slave-owners. 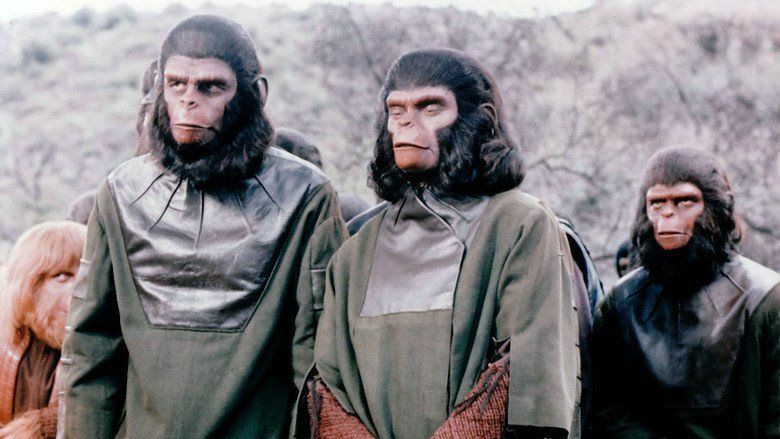 The apes and humans then decide to coexist with one another and begin a new society. They store their guns back in the armory: though some want them destroyed, Caesar and Virgil reluctantly agree that the danger of a future conflict when they will need them has not passed, and they will just have to wait for the day when they don't need their weapons anymore. The Lawgiver finishes his wrap-around narration, saying that it has now been over 600 years since Caesar's death. It is revealed he's talking to a group of young humans and apes; apes and humans have continued to coexist in peace. The Lawgiver notes that they still wait for a day when their world will not need weapons, but at least now, "we wait with hope". When asked by a human child "Who knows the future? ", the Lawgiver replies "Perhaps only the dead." A close-up of a statue of Caesar shows a single tear falling from one eye. Initially writer Paul Dehn who had provided the script for every previous sequel was hired to provide a story treatment for the fifth film in the series. Dehn withdrew from the project prior to completing the screenplay due to health reasons. Screenwriters John William Corrington and Joyce Hooper Corrington were brought in after the success of their film The Omega Man, although prior to that neither one of them had written any science fiction films and, indeed, Joyce Carrington later admitted they had never seen any of the Apes films prior to being hired to write the script for "Battle". Dehn was unavailable for the initial rewrites but was hired to come in and do a final polish on the script making minor changes to the script that the Corringtons had written. Dehn was given a story credit despite an appeal to the Writer's Guild of America for shared credit on the screenplay. Dehn claimed to have rewritten 90% of the dialogue and he altered the ending. The original script by the Corringtons ended on a playground with ape and human children fighting. Dehn chose to go with a close up of a statue of Caesar with a tear falling from its eye which Joyce Corrington characterized as "...stupid. It turned our stomachs when we saw it." The Writer's Guild of America ruled in favor of the Corringtons for sole screenplay credit. Principal photography took place on the Fox Movie Ranch for an estimated budget of $1.7 million. Heading into filming, director J. Lee Thompson was unhappy with both the script and the scope of the production, which he felt could have used a bigger budget to assist in the portrayal of the "Battle". Thompson had agreed to direct without a script in place and regretted that Paul Dehn couldn't have been on the project throughout the writing process. 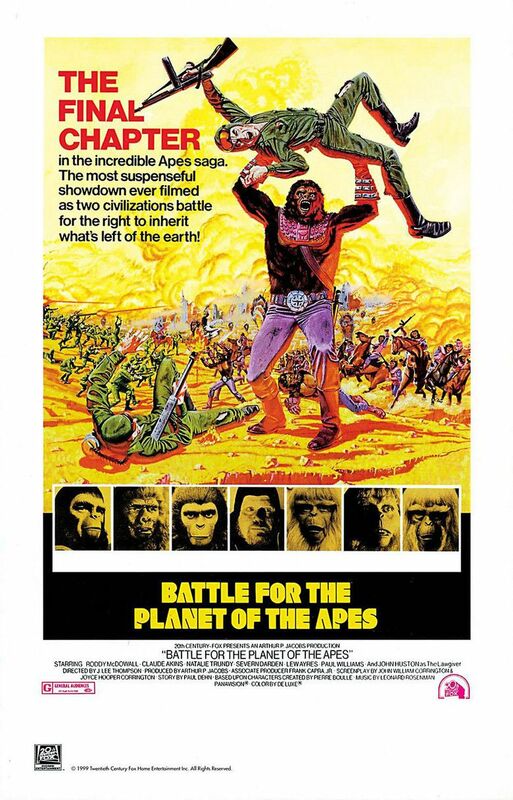 Battle for the Planet of the Apes was the second-to-last film produced by Arthur P. Jacobs. He died June 27, 1973 at age 51, less than two weeks after its release. The syndicated television version adds a few scenes cut from the theatrical release. One scene takes place after Aldo chases teacher Abe, where MacDonald reminds him why humans should not say "no" to an ape. 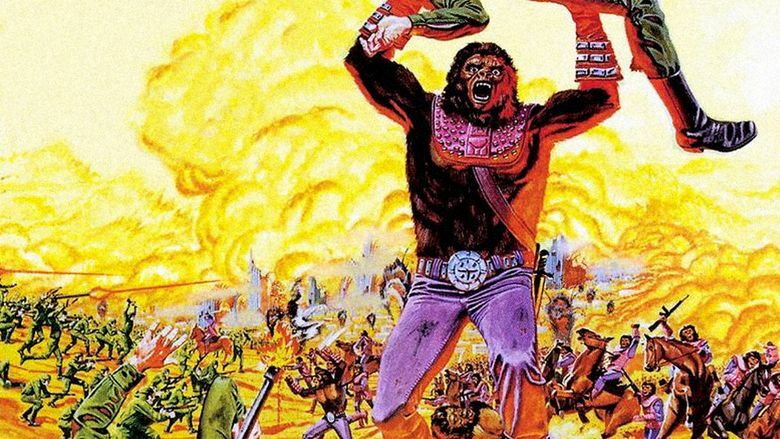 Another scene towards the end of the film shows the beginnings of the House of Mendez cult, as the humans in the city are about to fire off the doomsday bomb (as seen in Beneath the Planet of the Apes), but decide not to, as it would threaten the world. 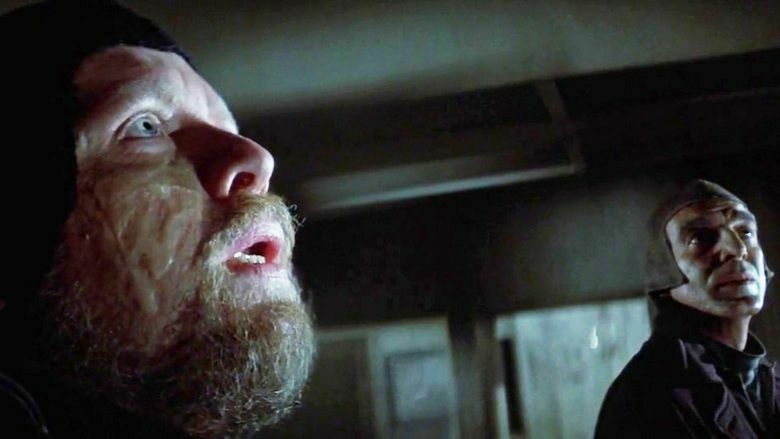 In Beneath, one can see many signs of Mendez in the Forbidden Zone, a hymnal on the pipe organ reading "Mendez II", busts of past leaders of the mutant society (such as Mendez XIV), and the mutant leader in Beneath is also named Mendez. It is clear that Governor Mendez is a different leader than his predecessors, Breck and Kolp, since he is more sympathetic to the apes; so long as they do not invade their territory. Near the end of the opening credits, the score continues to its original ending for 25 seconds, with extra footage of General Aldo approaching Ape City on his horse. The chase of the teacher of the apes is longer by 20 seconds. The mutant chief is walking around in his HQ, and has more dialogue. The entry into the ruins of the Forbidden City of the ape scout party with Caesar is 40 seconds longer, with more dialogue. The escape from the Forbidden City shows more footage and dialogue involving the apes. The scene where Cornelius is "shot" by a human boy begins slightly earlier, making it clear that the shooting is a game — which makes more sense, since no mutant party had yet even approached the ape city. DELETED SCENE: In this edited scene, Governor Kolp tells his lieutenant to fire an atomic missile on Ape City when he gives the signal. The mutant assault is 45 seconds longer. In this sequence there were three more smaller cuts that reduced the battle scene by 40 additional seconds, and originally there was no musical score. The scene where the Governor Kolp calls "Sergeant York" is missing. There are additional shots and dialogue before the mutants lay down the smoke screen. 355 more seconds of the battle were cut. The scene where Aldo kills Governor Kolp and his followers in the school bus has been restored. The fight between Aldo and Caesar is longer. DELETED SCENE: Mendez has become the new governor and talks the mutant lieutenant out of firing the atomic missile. As they argue, they discover it is the Alpha-Omega bomb from Beneath the Planet of the Apes. Battle for the Planet of the Apes grossed a domestic total of $8.8 million, making it the lowest-grossing film in the series. The film received mixed to negative reviews from critics. The film holds a 38% "Rotten" rating on the review aggregate website Rotten Tomatoes, based on 24 critical reviews. 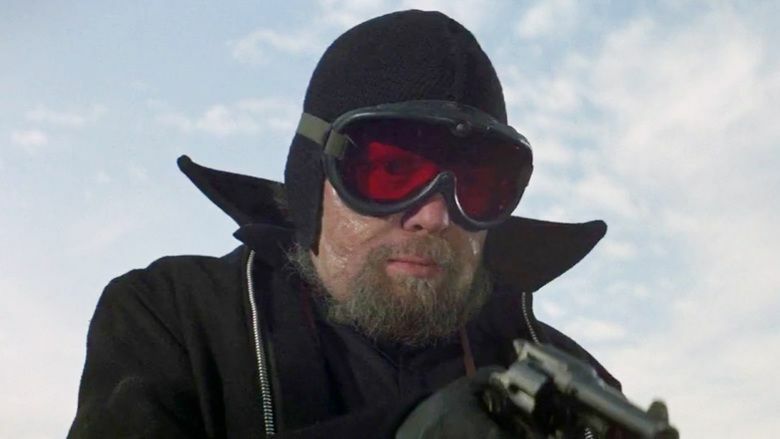 Roger Ebert of the Chicago Sun-Times gave the film a negative review, stating, "Battle looks like the last gasp of a dying series, a movie made simply to wring the dollars out of any remaining ape fans." In the 2012 film Argo, based on the 1980 "Canadian Caper" rescue from Iran of U.S. diplomats hiding at the Canadian ambassador's residence, Tony Mendez gets the idea for the fictitious Argo cover story from watching Battle for the Planet of the Apes on television. This was a nod to the role of Planet of the Apes make-up artist John Chambers in the Canadian Caper.